Noel Jetson was a renowned Tasmanian fly tyer and one of Australia’s first professional trout guides. 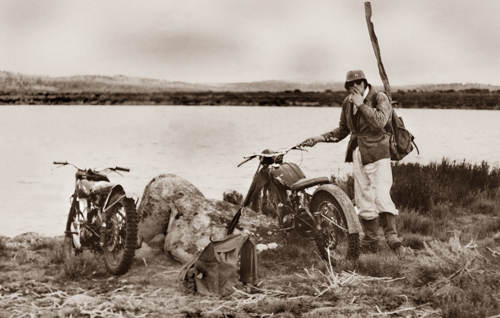 In order to extend his fishing horizons, in 1953 he bought a BSA Bantam motorcycle. His early trips on the Bantam were with Vic Haye – to the North Esk, Macquarie and South Esk rivers and also to Bradys Lake. Vic rode pillion and their camping, hunting and fishing gear was packed into a wooden box mounted on a small sidecar. Clyde Spencer was a great fishing mate of Noel’s and he demonstrated the Bantam’s off road capabilities and convinced Clyde it would open up vast new trout fishing areas to them. In the early 1960s Clyde also bought a BSA Bantam. They modified the bikes with rock guards and changed the gearing on the rear sprocket from 48 to 70 teeth. This lowered the top speed to 30 kilometres an hour but improved the low speed performance and capabilities to crawl over rocks and through the rough tracks. Before the modifications though, a trip was undertaken to the Julians Lakes and a flooded creek was in their way. Noel built a small ramp and jumped the creek, but Clyde didn’t make it and went in head first. The next trip to Julians with the big sprockets fitted was a huge success and took two hours. Around Christmas 1964 they reduced the time to around one hour and forty minutes. The Bantams lived up to their expectations for these adventurous fly fishers and they enjoyed many trips into Tasmania’s Western Lakes. Transport to the start of their journeys was in Clyde’s VW Kombi van. Noels Jetson’s Bantam can be seen at the Trout Fishing Museum at the Salmon Ponds at Plenty. Clyde Spencer’s Bantam is on display at The Australian Fly Fishing Museum. It is shown in its original state and Clyde claims it will still run.